Inside the stone walls of an 11th century-style castle, Medieval Spain comes to life as six knights, donning authentic armor, clash in a jousting tournament for the tile of “King’s Champion.” At Medieval Times you will see sparks fly and lances shatter as brave knights battle in sword-fights and hand-to-hand combat! Powerful tales of courage, chivalry and love become stronger through the test of time. You’ll enjoy a feast fit for a king! 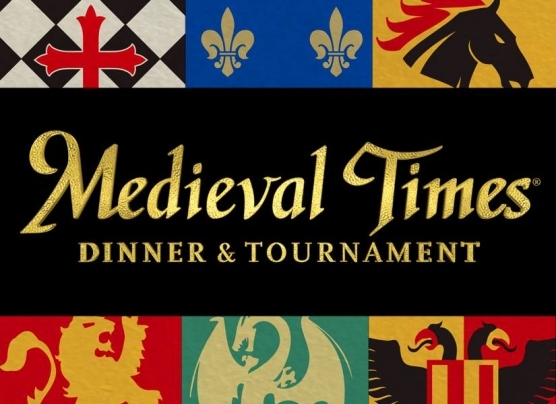 A four-course meal will be sure to satisfy the hungriest of knights. Find your fill with oven roasted chicken, garlic bread, tomato bisque soup, herb-roasted potato, spare rib, pastry of the castle and select beverages. Vegetarian meals are available upon request. Please advise your reservationists.